Secret Santa has been! We do that every year at the work Christmas Party, and here is what I got. 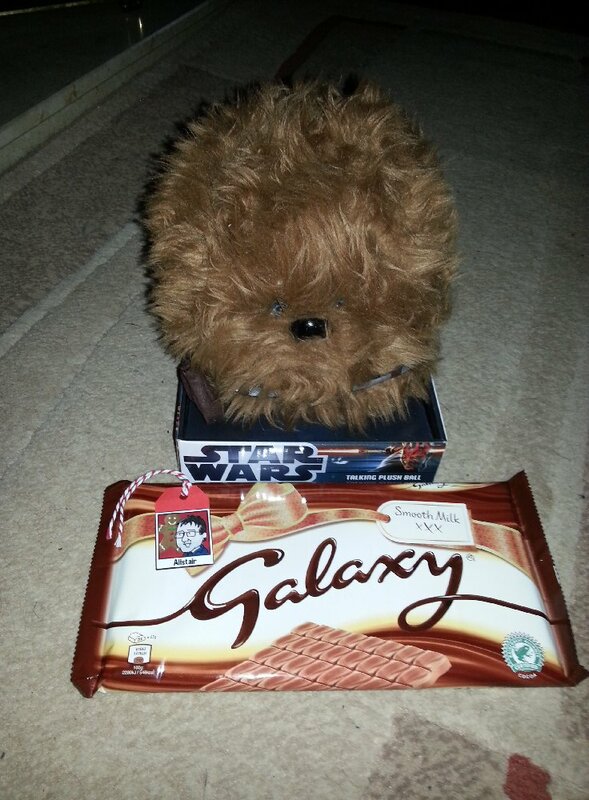 That’s a massive bar o’ chocolate and a “talking” Chewbacca. He makes Chewie noises when you squeeze him! The little tag is my work avatar, Christmas-ified as a present tag. I also went to the Christmas Market in the village hall. 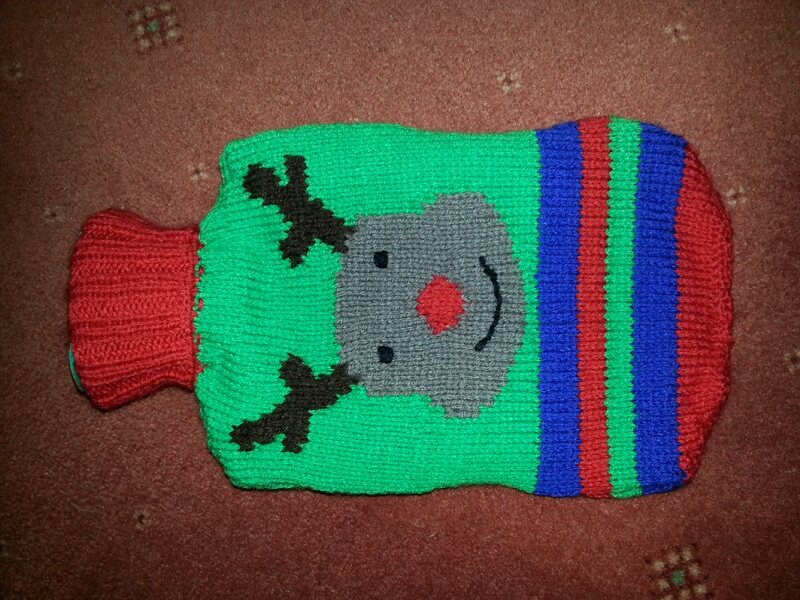 As well as sausages, bread and such I also bought this, ideal for keeping my tootsies warm. 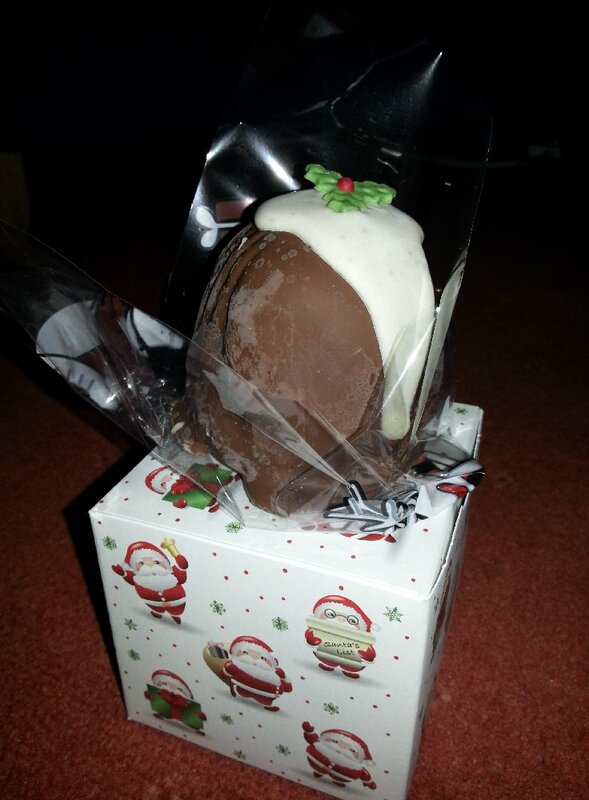 And also this – a dinky chocolate-coated one-man Christmas cake in a little box. I don’t really like Christmas cake all that much 🙂 but I couldn’t resist the cuteness of the little cake, so I also bought a pot of Cornish clotted cream to mask the taste. Love your presents! That was awesome. And the water bottle cover is too cute, as for your Christmas cake it’s cute but there isn’t enough cream in the world to make Christmas cake enjoyable I’m afraid. There are those who love it, and those who don’t and no one lives on the middle ground. ooooo I should be careful this could ignite WWIII… LOL! I’ve never liked fruit cake. It’s definitely a love it or hate it kind of food. I’m sure I’ll force it down, though! I was reading this and an email came through for World Market, where I can go and get clotted cream and Galaxy bars for three times the price y’all pay. I am going to pretend that isn’t a sign for me to go out now and buy such things. I thought it was somewhat Tribble-like too! Merry Christmas! I hope your Chewy doesn’t eat your Christmas cake! Happy Holidays! Now, onward cake! Ohhhh! your FF story is next in my reader 😦 I can’t read it till I do mine….I like the photo this week, whew! I never read the others ’til I do mine either. I don’t want to be influenced, or find out someone has written the same thing and have to change mine. Fun gifts, perfect for you. Merry Christmas! Yeah, they’re just right for me. Merry Christmas! Merry Christmas… What is clooted cream? Ans, I would wear the socks! Clotted cream is a very thick cream (you use a spoon to get it out of the tub). It’s a speciality of Cornwall and Devon mainly. 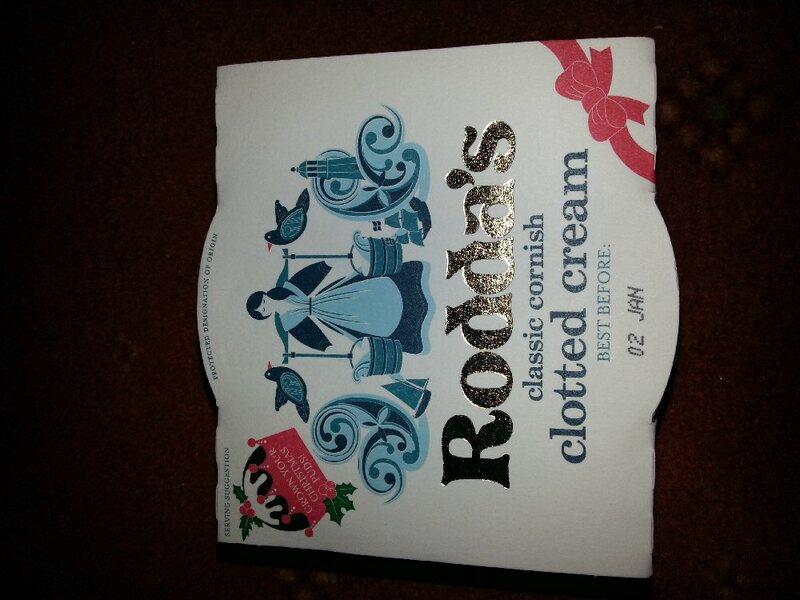 The brand I bought (Rodda’s) is made a few miles from where I live and is the largest producer in the UK. It can only be called “Cornish Clotted Cream” if the milk comes from Cornwall (it has EU Protected Designation of Origin status). He is a cute little fella! I checked the fat content of my clotted cream – 60.5%! Heh heh. In fact 55% is the absolute minimum for it to be called “Cornish clotted cream”. I didn’t realise it was possible to get that much fat into anything. I’m going to have to talk with my boss when I get back to work and ask why I don’t have a Mecca avatar…. You should definitely have a Mecca avatar. It’s an outrage! “Awwrawwr rawwr awwawwrrr” to you and yours too! yummy and useful gifts you got:and bought:) cheers! I’ve eaten the little cake now – it was actually very nice! I’m a week late but Merry Christmas to you. You’ve been good company those times I’ve needed a laugh this past year. Chew baca, ahh my man. Not a clue why even after all these years but I had the biggest crush on him from the moment I first saw him on the big screen. Strange. Chewie does look like he’d be quite cuddly. Sharing My World Week 50 Christmas Miracle!